For Summer 2019 we are offering several classes: PSY201 (online), PSY340 (online), PSY344, PSY/CD356 (formerly numbered PSY/CD456), PSY372 and PSY564 (for current graduate students). Graduate Celebration Dinner- Tickets Now on Sale! The PSYCD annual Graduate Celebration will be held Thursday May 16th at the Madonna Inn, 6pm to 9pm. This is a semi-formal event for all of our graduating PSY & CD seniors and MS students. Anyone graduating this WN, SP or next FA is included. Purchase your ticket by May 8th, tickets will not be available at the door. *Due to the high volume of students, we regret that we cannot admit non-PSYCD students, family or friends at this time. If the circumstances change, we will let you know. Tickets are now on sale in the department office for $20 (cash or check only) or use the Buy Now link at the bottom of the Graduate Celebration page to pay with a credit card. To apply, click on Cal Poly Scholarships on the portal to complete the general scholarship application and the PSY CD department application. By completing the application, you will also be considered for a wide range of university-wide scholarships as well. Check the Financial Aid website for more information. Save the date for the 8th Annual Senior Project Symposium on June 6th in UU220, 11am to 1pm. Gain presentation skills, add to your resume, show off your hard work and support your peers while enjoying free pizza. Win prizes and awards! Submission information forthcoming. REMEMBER: Prereqs for PSY 453 is PSY323 and junior standing. Prereqs for CD330 are CD 230, PSY 323, and junior standing. *Exception:You do not need to attend a meeting if you are currently in PSY453 or CD 330 and either plan to continue in the same placement for PSY454 or CD 430, or have already arranged a research internship with a faculty member (i.e. PSY448/449 OR CD333 or 433). If you are planning to pursue a new site, you must attend. For more information on the internship process and available internship sites, please go to the Internships link on the department website. Contact Professor Carrie Langner (clangner@calpoly.edu) if you have questions. PSY323 Helping Relationships. Important Information! The Helping Relationships class (PSY323) needs volunteers to be helpees! Pay it forward...being a helpee is a great way to see what is involved in the class before you take it. Or pay it back...if you took Helping you know how important helpees are to the class experience. Learn how to become a helpee. PSI CHI Fishbowls THIS WEEK! Library Fishbowl hours are open each week for use to ALL PSY and CD majors. You don't have to be a member of Psi Chi to use them. Mark your calendars for upcoming events that will help prepare you for graduate school! Check out the Professional Exploration page on the department website for useful information including the power point slides from the April 12 Grad School Panel. Upcoming graduate school-related events put on by Career Services. Looking for Spring Commencement Information? Click HERE. The PSY & CD department will not hold a reception prior to the ceremony which begins at 5pm on Sunday June 16th. Consider making lunch reservations soon! Wondering if you can take a class credit/no credit? Cal Poly's policy on taking a course for credit/no credit. Courses in the PSY & CD major can NOT be taken for credit/no credit, including support courses. Planning your schedule for next year? The Tentative Course Offerings link has been updated to reflect the courses we are planning to offer this summer and next year. Keep in mind that this is a tentative list so offerings can change. Also, remember that PolyPlanner is not as up to date as our link. Check out all the upcoming Study Abroad Info Sessions HERE! NEW! The Emotion and Behavior (EB) Lab in the Department of Psychology at the University of Virginia - Interested candidates can find more information and application materials here. NEW! The Polarization and Social Change Laboratory at Stanford University - Interested candidates can find more information and application materials here. NEW! The Appetite Lab in the Division of Child & Adolescent Psychiatry in Baltimore - Interested candidates can find more information and application materials here. NEW! Learning Research and Development Center at the University of Pittsburgh - Interested candidates can find more information and application materials here. NEW! Mathematics, Reasoning and Learning Lab and the Language, Behavior and Brain Imaging Lab at Rutgers University in Newark, New Jersey - Interested candidates can find more information and application materials here. NEW! Cognitive & Developmental Neuroscience Lab at the University of Massachusetts Amherst - email joonkoo@umass.edu with a cover letter and resume. The Center for Early Cognition and Language at the University of California, Merced - Interested candidates can find more information and application materials here. The Temple University Infant and Child Laboratory at Ambler - Interested candidates can find more information and application materials here. The Computational Cognition and Learning Lab at Indiana University - Interested candidates can find more information and application materials here. The BabyTalk Project at The Ohio State University Medical Center - Interested candidates can find more information and application materials here. The Kable laboratory at University of Pennsylvania - Interested candidates can find more information and application materials here. The Applied Mind and Health (AMH) Lab at Claremont McKenna College - Interested candidates can find more information and application materials here. The Developmental Cognitive Neuroscience lab at the University of Texas at Austin - Interested candidates can find more information and application materials here. The Frank Batten School of Leadership and Public Policy at the University of Virginia - Interested candidates can find more information and application materials here. The Bergelson Lab at Duke - Interested candidates can find more information and application materials here. The Aging, Culture and Cognition Laboratory at Brandeis University - Interested candidates can find more information and application materials here. Research Assistant, 528383. NEW! The Computational Cognitive Development Lab directed by Dr. Elizabeth Bonawitz at Rutgers University - Newark is seeking one to two motivated undergraduate students for a funded summer research program. Click here for more information and application materials. Applications due April 22nd. Teach Reading Classes to Students of All Ages! The Institute of Reading Development offers summer reading skills programs in partnership with the continuing education departments of more than 100 colleges and universities nationwide. Each year we hire hard-working, encouraging people with a passion for reading to teach our summer programs. Interested students can learn more information here. NEW! 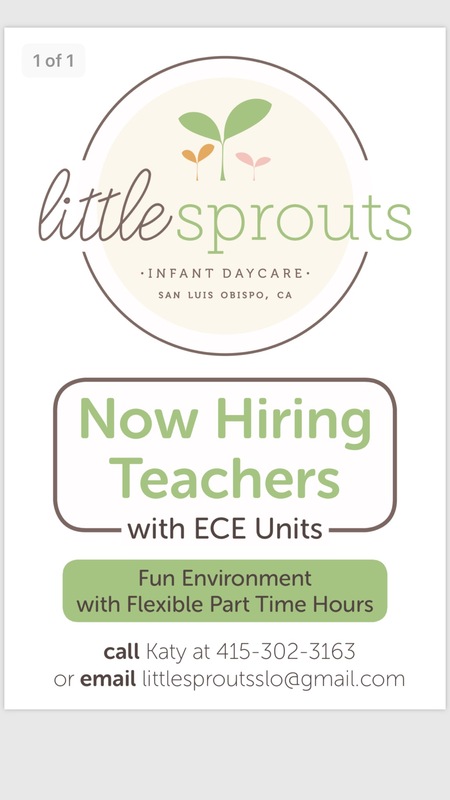 Little Sprouts Infant Day Care is looking for students with ECE or CD units looking for a job in SLO for the summer. NEW! The Preschool Lab is in need of student assistants who are available to work on Tuesday/Thursday (morning and/or afternoons).To apply, please send your resume and available work hours to Dr. Clarkson (pkclarks@calpoly.edu). The pay is $11 per hour and you must have successfully completed CD230. 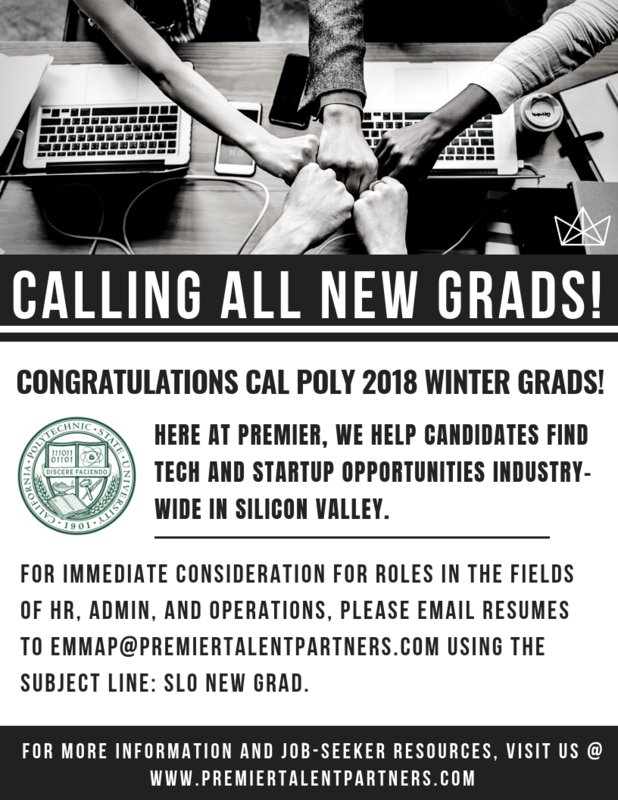 Premier Talent Partners helps new grads find tech and startup opportunities in the Bay Area. Dunes Center is looking to hire Educational Program Interns for the spring quarter. Check out current and summer job openings with SLO County YMCA. Volunteer with Central Coast Aquarium - Avila Beach. No marine science experience necessary! Check out Cal Poly's Student Community Services for a list of current volunteer opportunities. *Internship opportunities posted here are not part of the department internship program. But its always good to add these experiences to your resume! Looking for a Professor's Office Hours? Click on the FACULTY link on the psycd website. Here you will find a PDF link with a list of the PSY & CD professors and their hours and office locations. The SLO Counseling Service at Cal Poly offers short-term counseling and consultation services.